Maybe you spent some time in your childhood hovering over an anthill and watching in fascination as the busy little insects scurried about. And maybe that watching soon evolved into other activities—some less benign than what you encounter in the pages of National Geographic. Maybe there was some mound-stomping or perhaps even a magnifying glass involved. We’re not trying to judge you here. Fire Down Below: You can do nice things for your six-legged subjects in Ant Hill, like feed them strawberries. Or you can do not-so-nice things like use a magnifying glass to scorch them. Or you can do both. Ant Hill, a simulation game from Concrete Software, takes you back to those days of childish experimentation. 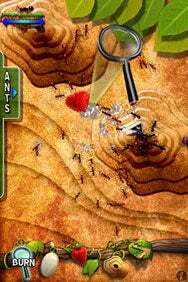 In this $1 app, you find yourself once again hovering over a colony of ants, facing the same decision posed by the more involving Pocket God ( )—either play nice or spread a little mayhem. Ant Hill features red ants and black ants—they don’t seem to get along very well. You can control the number of ant as well as the ratio between the rival colors. You can also choose their level of aggression and move the ant hills around. Once you get things set up the way you like, there’s a few different ways to interact with your six-legged subjects. You can feed them fresh strawberries, smash them with rocks or just bust out the old magnifying glass and watch them burst into flames. The ants react to whatever you do in different ways. You can even set up race where each ant colony tries to push a rock off screen before their rivals do. Frequent updates from Concrete Software have added other ways to mess with the lives of your virtual ants—an ant magnet lets you collect ants and move them all over the screen, while mines deliver your poor ants to an explosive fate. Still, messing around with an anthill gets old quickly. There’s just not enough here to hold your attention for very long. Ant Hill is compatible with any iPhone or iPod touch running the iPhone 2.2 software update.